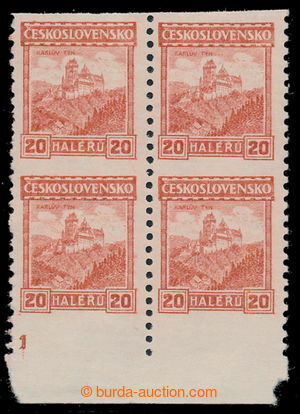 1926 Pof.216A, Castles 20h orange, coil stamps, without watermark, marginal block-of-4 with plate number 1 (! ); luxury, certificate Vrba, cat. 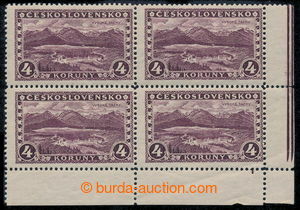 36.000Kč, coil- stamps without watermark are very rare, here in addition with plate number, extraordinary offer! 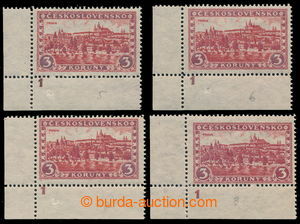 1937 PLATE PROOF Pof.A329/330, imperforated miniature sheet Bratislava 1937 with omitted print of red color, without print of value 1kč and Coat of arm; original gum, hinged, certificate Vrba, exp. 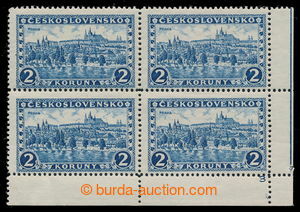 by Karasek, rare occurrence!